The recent Wall Street Journal article, The Dying Business of Picking Stocks, has generated a lot of buzz over the last day and a half. Despite the tidal wave of money going out of stock picking and into indexes, and the thousands of articles that accompany them, it’s still not entirely clear what it means to be an active or passive investor. Here is how I think about it: The active investor attempts to beat a benchmark by either picking individual securities or by timing the market. A passive investor is one who uses index funds and doesn’t make changes to their portfolio based on what the market is doing today or might do in the future. Simple enough right? Wrong. There are even gray areas in my simple definition. For example, what if some of your index funds are fundamentally weighted? Or what if they are factor based? Or what if they hedge currencies? Or what if the indexes you’ve chosen only include companies in your home country? The S&P 500 currently holds 506 stocks. The 506th biggest stock in the Russell 3000 is $8.12 billion. But there are 66 S&P 500 stocks with a market cap under $8.12 billion. The smallest stock in the S&P 500 has a market cap of $2.76 billion. There are 269 stocks in the S&P 400 midcap index that are bigger than $2.76 billion, or 67% of the index. At the end of the day, how you label different parts of the market matters very little. Arguing whether you’re a passive or active investor, or whether markets are fully or somewhat efficient, does nothing in terms of helping you accomplish your goals (By the way, nowhere does it say you have to choose a side. There is more than enough room for both). What I find to be the most interesting (and unanswerable) part of this discussion is what impacts the rise of indexing will have on the markets and what this will do in terms of opportunities for stock pickers going forward. 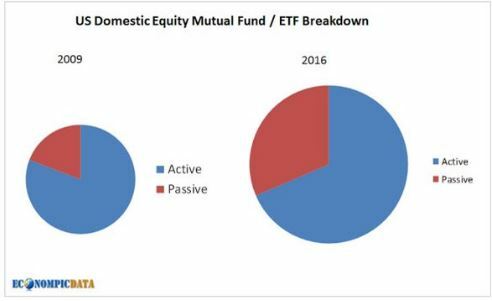 The massive shift in asset allocation away from active investing towards passive investing exacerbates this effect. Thirty years ago, index funds were less than one percent of assets under management, and today they (along with other passive vehicles such as exchange-traded funds) are about one-third. Think of it this way: For you to have positive alpha, the industry’s term for risk-adjusted excess return, someone has to have negative alpha of the same amount. By definition, alpha for the market must equal zero (before fees). So you want to compete against less-skilled investors because they are your source of alpha. It is disadvantageous for you is the weak players flee the market (selling their stocks and buying index funds), or if the least capable professional investors lose assets to passive funds, because it means that only the smartest investors remain in the active game. The truth is that weak players. whom the strong players require to generate excess returns, are fleeing at a record pace. First, while index funds and index exchange-traded funds (ETFs) now approach 30 percent of stock market assets, their turnover is so small compared to that of active investors that they account for less than 5 percent of trading, and trading is what sets price. Second, the only way to reduce the competitive striving of active managers would be to make their work so unrewarding that they would decide to quit. Given how highly compensated active managers are these days, it would take an awfully large drop in compensation to cause many active managers to leave the market. The amount of money in actively managed mutual funds and ETFs has shrunk from 84% to 66% over the last decade. So while we are experiencing a secular change in the way dollars are allocated, here is a good visual from Jake at Econompic showing the claims of “death” are overblown. Again, getting caught up in the minutiae of what’s active and what’s passive, while good for blog posts, is completely irrelevant in the real world. What matters more than defining these terms is defining your philosophy and what you believe in.